So you’ve managed to book a seat sale to Palawan. Now all you want is to save more money on your Palawan accommodation. If you’d rather splurge on food and set aside your budget on fun and exciting things to do in Palawan, there’s one thing you need to do. Look and book for the best cheap hotels in Palawan. In this article, we’ll share with you a list of affordable hotels in Palawan sorted by town. Whether you’re planning a Coron, El Nido, or Puerto Princesa tour, we’ve got you covered. Let’s start with the most popular destination in Palawan—El Nido. Located at the northern part of the island, this town is filled with many spectacular limestone karsts and its small islands are also exciting to explore. You can go to secret beaches, join an El Nido island-hopping tour, eat sumptuous dishes and scuba dive. Where to stay in Palawan El Nido that's close to the beach without breaking your budget? Look no further than the Garden Bay Beach Resort in El Nido. Situated right on the beach, this is arguably the best hotel in El Nido Palawan that anyone can afford. Even stingy and budget travelers. On top of the premier location, you can enjoy an on-site restaurant, bike rentals and of course, Wi-Fi so you could upload your Instagrammable pics immediately. For mid-range El Nido Palawan accommodations, we highly recommend Lio Villas Resort which has been one of the best resorts in the Philippines. Amenities you can look forward to include air-conditioned rooms, Wi-Fi, massage, bike rentals, outdoor pool and laundry service in case you are planning to stay longer. Coron, which is located off the northern coast of Palawan, is a true paradise and is your gateway to nature. Aside from the mesmerizing landscapes, there are a number of fun things to do in Coron. From snorkeling to hiking, relaxing in hot springs, diving and taking a dip in the cleanest lake in Asia, you’ll probably want to stay longer. With the numerous Coron Palawan hotels available, why Kokosnuss Garden Resort? This Coron Palawan resort offers fan and air-conditioned accommodations, on-site barbecue and restaurant, Wi-Fi, laundry, and massage service. But the best thing about Kokosnuss is its location. It’s a mere 5-minute walk from the town proper, 10 minutes away from the trailhead to Mount Tapyas Point and a 25-minute tricycle ride to Maquinit Hot Spring. Your Palawan adventure couldn't get any more convenient than that. Located at the town proper, it offers air-conditioned rooms with free Wi-Fi, as well as an on-site restaurant and bar. The Princess of Coron Austrian Resort is just over 5 kilometers away from Kayangan Lake and Twin Lagoon, and under 3 kilometers away from Maquinit Hot Spring. Puerto Princesa is the capital of Palawan, and unless you go directly to El Nido, you’ll land at the airport in this city. Many travelers use this city as a base to go to Sabang, Palawan, where the world-famous Palawan Underground River and Honda Bay are. 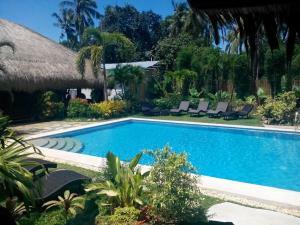 Southwind Palawan is a fairly new hotel that offers affordable accommodation, free Wi-Fi, breakfast, an on-site restaurant, outdoor pool, and a free shuttle service. Another good budget-friendly accommodation is Panja Resort Palawan which has air-conditioned rooms with Wi-Fi, an outdoor pool, a sun terrace, rooftop bar and on-site restaurant, as well as a free shuttle service. This affordable resort offers a private beach area, an outdoor pool, air-conditioned rooms with Wi-Fi, on-site restaurant, and airport transfers free of charge. Here, you can also use sailboats, kayaks, and SUP boards all for free! Plus, the Blue Palawan Beach Club is close to Honda Bay so you can also visit it. Traveling doesn’t have to be costly. If you know where to look, it’s easy to find the best cheap hotels in Palawan. Just choose one of the Palawan resorts and hotels we recommended above and you're ready to enjoy Palawan on a budget.